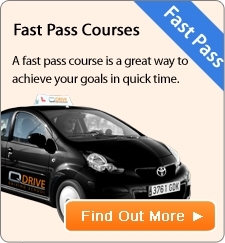 Q Drive Driving School based in Birmingham offers Fast Track Driving lessons and Fast track Driving Courses to help you pass your Driving Test Faster. Q Drive Driving Instructors are among the highest qualified ADI driving instructors in the country, with qualifications ranging from BTEC in Driving Instruction, RoSPA Gold standard Advanced drivers, Fleet trained and Driving Instructor trainers. Call us today to discuss your requirements. Wether it's your goal to pass your practical test within a week or a month, Q Drive Driving School can find a Fasttrack Driving Lessons Package to suit you. We cover Manual Driving Lessons and Automatic Driving Lessons in Sutton Coldfield, Solihull and Biringham & the surrounding areas. Call now for further information.